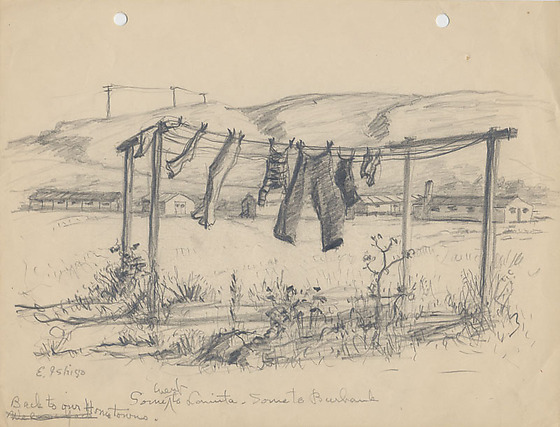 Pencil drawing of clothes hanging on a clothesline in middle of field with barracks in background. 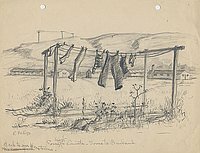 Central image are the pants, shirts and cloths pinned to clotheslines spanning wooden frames in the middle of a field ; plants growing below. In the distance barracks are visible at the foot of a mountain with powerlines. Written in pencil, lower left: E. Ishigo / [scratched out writing] Back to our Home towns. / Some went [inserted] to Lomita, Some to Burbank.